MyData 2016 is an international conference that focuses on human centric personal information management. MyData is an initiative to help people gain more control over their personal data. Let’s shape the future of personal data management together! The new EU General Data Protection Regulation allows people to have more control over their personal data. EU GDPR takes effect in 2018 and now is the time to design new business models and services. Like Big Data, MyData is an umbrella term for a type of personal data management that encompasses many different projects and initiatives. Like an email account, MyData operators can be hosted by many different parties, or even self-hosted. It is not one particular tool or company. Like mobile telephony, MyData will have succeeded when it is a global, accessible network that anyone can plug into. This is what we are working toward. There are many initiatives around the world, ranging from technical to legal, that fall within the MyData framework, whether they use the term “MyData” or not. While there is an active MyData movement in Finland, it was inspired by initiatives from around the world and the MyData team in Finland is collaborating with others to make this system work. Born out of the Open Knowledge movement, MyData is being developed as an open standards platform that will facilitate both for-profit and not-for-profit data-based services. 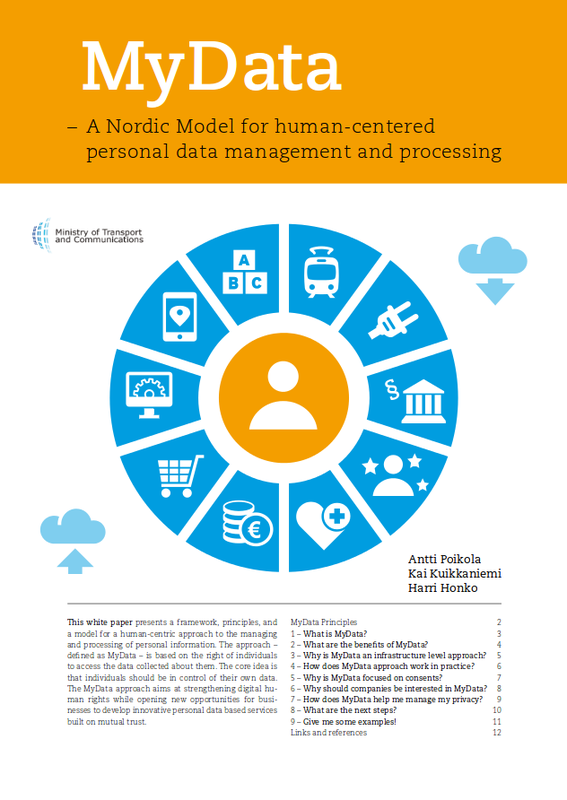 We have published a white paper together with the Finnish Ministry of Transport and Communications. Read our short summary here.